If you are looking for the perfect business backpack, few brands come as recommended as Tumi. In this guide we help you find the best Tumi backpack for travel, business and laptop carry. Each backpack is judged for their special features, carry options and overall design. Tumi is a brand known for their high end backpacks and bags for work and travel. What we love most about Tumi is their dedication to good design and quality craftsmanship. Each bag is built for a purpose and because of this attention to detail, Tumi makes some of the best backpacks available today. Tumi separates their bags into diverse style collections. For example, the Alpha2 collection focuses on travel bags while the Alpha Bravo line offers stylish men's business backpacks. Each collection specializes in different functions such as travel, casual and work carry. In this guide we take a closer look at what the brand offers and list the best Tumi backpacks based on their function. Although some of the design elements may be similar, each Tumi backpack is designed to suite a different lifestyle. Let's explore which Tumi backpack is the best for you. What makes a good travel backpack? It’s a simple formula when you break it down; A roomy main compartment, comfortable carry with the option to stow away on luggage handles, checkpoint friendly laptop compartment, and enough pockets to store the small things that make your trip more comfortable. Those who are traveling for business are also going to want to have enough room for files, binders and other business essentials. Luckily, Tumi offers a variety of travel backpacks that fit these requirements. Here are our favorites. The Tumi T-Pass Business Class Brief Pack is the best Tumi backpack for travel thanks to it’s thoughtful TSA friendly design, generous carrying capacity and Tumi Tracer technology. This backpack was especially designed for business air travel by meeting TSA checkpoint requirements which allows you to go through security without taking your laptop out of the case. It also features a very generous main compartment which allows comfortable storage of carry-on items. One of the reasons the T-Pass Business Class Brief Pack is perfect for travel is the inclusion of Tumi Tracer technology. Tumi Tracer is an exclusive Tumi program that assigns a unique serial number to your backpack for easy location if ever lost or stolen. The Tumi Alpha 2 Compact Laptop Brief Pack is aimed at professionals who want a reliable travel backpack without too much bulk. The main compartment features a padded 15-inch laptop section and an extra pocket for tablets. For those who need a business travel backpack, the The Alpha 2 Compact Brief Pack includes a removable file divider, card pockets, and small item pockets to safely store your business files and items. While smaller than the T-Pass Business Class Brief Pack, the Alpha 2 Compact Brief Pack can still hold enough items to use as a comfortable carry-on backpack during air, train or bus travel. The Ursula is the largest Tumi backpack for women and the most versatile when it comes to business travel. Features include a large main compartment for everything from extra clothes to business files and a separate TSA-friendly laptop compartment that folds out completely for easy security checks at the airport. When you add in the high quality craftsmanship and stylish design you can easily see why the Tumi Ursula T-Pass is the best Tumi backpack for travel. For ladies, Tumi offers a stylish travel backpack that is TSA checkpoint ready with their Ursula T-Pass backpack. This backpack is the perfect blend of form and function. Unlike the Tumi’s Brief Packs, the Ursula T-Pass backpack loses the bulky features for a more sleek silhouette with feminine accents. Inside the backpack you’ll find a laptop compartment that meets TSA checkpoint requirements for an easier time at airports. A roomy main compartment can fit business files, extra clothes and other personal items with ease. The Tumi Sheppard Deluxe Brief Pack combines all of the features of a business briefcase with the hands-free convenience of a backpack. On the inside you’ll find two main compartments; one for your laptop, tablet and files and a second compartment for other larger items. The front zip pockets are perfect for carrying small accessories such as pens, keys and business cards while the side pockets can fit water bottles or umbrellas with ease. What makes the Tumi Sheppard Deluxe Brief Pack such a great business backpack is it’s mature and professional design. Available in a few different colors, the Sheppard Deluxe Brief Pack won’t look out of place in the office or during commutes. It’s features like these that make the Sheppard Deluxe Brief Pack the best Tumi backpack for business carry. Tumi hits a home run with the Alpha Bravo Nellis backpack. This business backpack is modernly stylish yet sophisticated enough to wear daily to the office or while traveling. The reason the Tumi Nellis makes such a great backpack for business wear is it’s main compartment that features a separate sections for keeping files and paperwork organized while on the move. Other great features include plenty of organizers and pockets for pens, business cards, water bottles and more. For those who travel often and need a versatile business backpack, the Nellis even features an add-a-bag sleeve that allows it to be attached to roller luggage for easy carry while traveling. When it comes to women’s backpacks for work, very few brands come close to quality and style as Tumi. Their Voyageur Carson backpack is proof that you can have both a stylish design and useful business carry features in one backpack. The bag itself is made out of an attractive nylon that is both weather resistant and durable enough to last through even the most hectic of commutes. Inside you’ll find plenty of useful features such as a 15-inch laptop compartment, pen loops, and a tech accessories pocket. Whether you are looking for an everyday business backpack to take to work or a travel backpack for those busy work trips, the Tumi Voyageur Carson is the backpack for you. 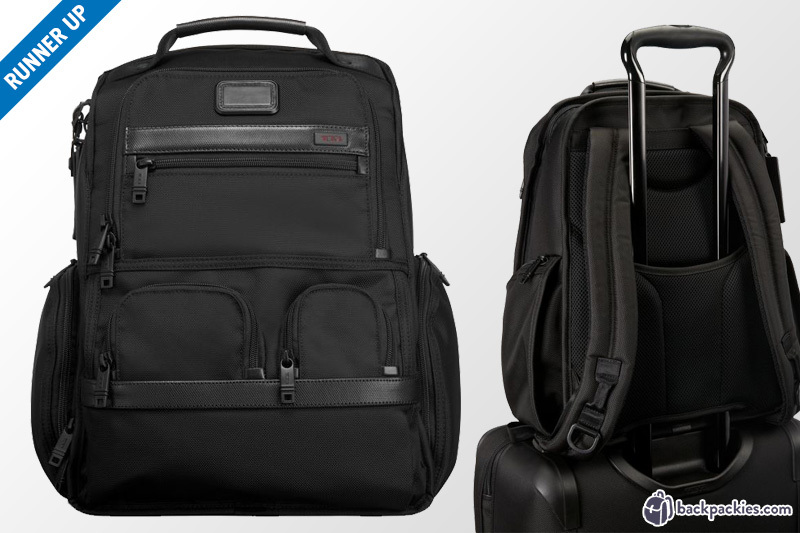 Tumi’s Alpha Bravi Davis backpack is our favorite Tumi backpack for laptop carry. This slim backpack offers room for a 15-inch laptop as well as a separate pocket for an iPad while still having enough room for everyday carry items and tech accessories. The Alpha Bravo Davis is the best Tumi laptop backpack for anyone who needs something simple to carry their laptop and tech to work, school or during travel. For those on the go, the Alpha Bravo Davis includes an add-a-bag sleeve for easy attachment to luggage while traveling and Tumi Tracer to give you peace of mind in case you bag is ever lost or stolen. If you are looking for an everyday laptop backpack for business or school, the Alpha Bravo Davis makes it easy to carry books, files, business cards and more thanks to it’s roomy main compartment and front pocket organizers. The Tumi Alpha Bravo Nellis is the best laptop backpack for those who need more room for everyday carry. 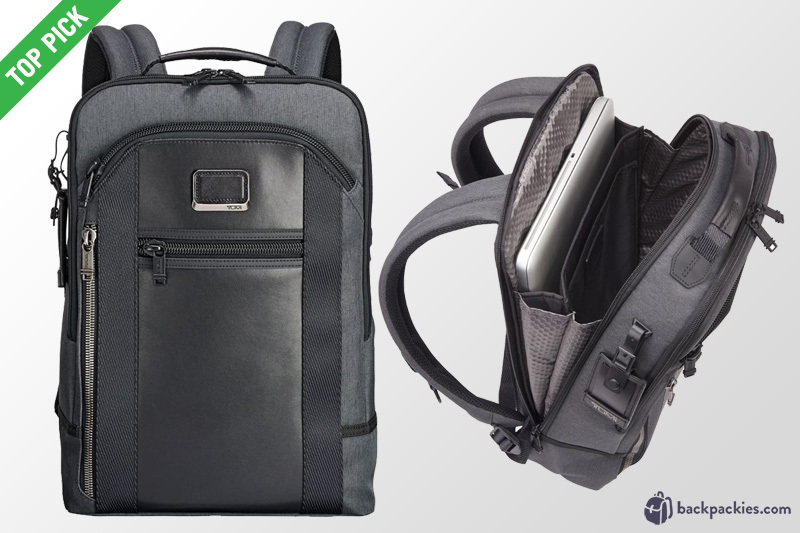 This backpack features a dedicated 15-inch laptop compartment and a separate tablet pocket. A front U-zip pocket makes it easy to carry extra tech such as a mouse and keyboard, headphones or charging cables. For those looking for the best Tumi laptop backpack for work, the Nellis includes a main compartment that is perfect for carrying files and paperwork while still leaving room for your daily essentials. The Nellis’ included Tumi Tracer tech also allows you to keep track of your backpack if ever lost or stolen. Perfect for business - includes card pockets, pen loops and room for files and papers. Stylish. Sophisticated. Tech ready. The Tumi Stanton is our pick for the best Tumi laptop bag for women thanks to it’s versatile style and convenient laptop compartment that is separate from the main compartment for easy access to your tech on even the most hectic of days. Leather top handle allows you to carry it as a hand bag. The Tumi Stanton Indra is one of our favorite women’s Tumi laptop backpack for daily carry. One of the reasons we love this bag is because of its separate laptop compartment that keeps your computer easy to reach at all times. Many women’s laptop backpacks for work include their laptop sleeve inside the main compartment and it can quickly become a hassle to rummage through a full bag to reach you tech. When it comes to style, the Tumi Stanton is as versatile as they come. The design is sophisticated enough to wear to work but it can also double as a bag for weekends and travel thanks to its roomy main compartment and front panel organizers that make it a breeze to store personal items. For busy travelers, the Indra includes all of standard features we have come to expect from a Tumi bag. The Tumi Stanton Indra also includes an add-a-bag strap for easy attachment to luggage when on the move as well as Tumi Tracer tech to help you recover you bag if ever lost or stolen. And like a few other of our favorite women’s Tumi business backpacks, the Indra allows you to switch between a backpack and a handbag when you need it most. Choosing the best Tumi backpack for business, travel or everyday carry is as simple as deciding which Tumi collection best suits your needs. Tumi makes it easy to find the right bag for you by dividing their bags into different collections. While the Alpha2 collection is best for those who travel often, the Alpha Bravo and Harrison collection may be better suited for those who need an everyday business backpack to take with them to work or school. Below is a quick review of the different men’s collections. Tumi Alpha Bravo - The Alpha Bravo collection specializes in men’s backpacks for business, school and travel. The style is modern and mature enough for daily commutes while still being casual and stylish enough for weekend carry. These backpacks are perfect for everyday carry to work, school or wherever you need a reliable bag to carry laptops, files and paperwork and small business essentials. Tumi Alpha - Choose from the Alpha line if you are looking for the best Tumi has to offer as far as travel backpacks, roller luggage and duffel bags. The collection features bags made out of Tumi’s signature ballistic nylon that can withstand even the most hectic of travel schedules. Each Alpha backpack features TSA friendly designs, roomy main compartments for light packing and must-have travel features such as ticket pockets, add-a-bag sleeves and organizer pockets. Tumi Harrison - The Harrison collection offers a variety of men’s backpacks, briefcases and messenger bags for those who need functional daily use bags for work. The designs and colors are modern and timeless with the use of sophisticated materials such as leather and high quality nylon to complete the look. Tumi Harrison bags are perfect for those looking for the best Tumi backpack for business that doesn't compromise versatility for style. One of the reasons Tumi has become so popular is because they offer functional business backpacks in smaller women’s sizes. While most business backpack brands only offer a one-size fits all solution for both men and women, Tumi not only offers bags for smaller frames but designs their women’s backpacks to be stylish and chic to boot. Below are the different Tumi collections offered for women. Tumi Voyageur - The Voyageur collection is Tumi’s signature travel bag collection for women. Each Tumi Voyageur backpack is designed from the ground up to be the perfect travel and business companion for women who lead a busy lifestyle without compromise. The designs are sophisticated and versatile while still having a feminine touch. Some of the most popular travel backpacks in the collection are the Tumi Calais backpack and the Tumi Ari T-Pass backpack. Tumi Stanton - Tumi’s Stanton collection is for women who need stylish yet functional everyday carry backpacks for work, school and travel. The designs are mature and work-ready while the features are perfect for hauling laptops, business files and everyday essentials. The Tumi Stanton line currently offers women’s backpacks, totes and briefs so that you can stay organized no matter your style. Tumi Mariella - The Mariella collection is Tumi’s premium bag collection for women that blends fashion with the high quality craftsmanship that Tumi is known for. The collection is currently much smaller than Tumi’s Voyageur and Stanton collections with only offering a backpack and couple of satchel designs. The Tumi Mariella collection is perfect for those who want a functional small bag that is modern, stylish and ahead of the curve. Select Tumi bags include what is called Tumi Tracer technology. Tumi Tracer is an complimentary product recovery program offered by Tumi to help reunite lost and stolen bags with their owners. The way the program works is that each bag is fitted with a metal plate that features a unique 20 digit tracer number. This number is linked to a database that includes the contact information of the owner. If your Tumi bag is ever found, the Tumi Tracer number allows the Tracer team to contact you. In order to take full advantage of Tumi Tracer technology, each new Tumi bag owner must first register their bag via the Tumi website. This allows the database to link the bag to your name and contact information. Participating in Tumi Tracer is free and registering your Tumi bag is recommended if you plan on traveling with your Tumi products. Tumi T-Pass is a special design that allows travelers to meet TSA checkpoint requirements for easier and faster security passes. Special Tumi backpacks are outfitted with the Tumi T-Pass design and you’ll notice that these bags all have a special laptop compartment that opens up like a clamshell. This design allows for scanning of the laptop without having to remove it from the bag. Tumi T-Pass is perfect for those who travel frequently and don’t want to be slowed down by TSA security checks.